First Line: On the far horizon, beyond the shifting grey dunes, a lone jackal howled, fell silent, then howled again. For decades men have been searching for Q-- the lost Christian gospel many believe to have been written by Jesus himself. Some want to destroy it. Some want it for the power and wealth they believe it will bestow upon them. A very few believe it will usher the world into a new and wonderful era. When documents, maps, and a renowned scholar capable of interpreting them all go missing, an elderly monk knows that the hunt for Q has begun all over again, and he travels to New Zealand to find the only man he knows of who can possibly help: Declan Stewart. 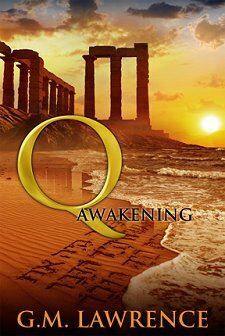 Years after his own search for Q ended in disaster, Stewart is hiding from the world, but the monk convinces him to return to the Middle East... and his destiny. Once there, Stewart finds ruthless men led by a mysterious figure called "the Persian," and these men will stop at nothing to find this missing gospel. As the first book in a trilogy, Q: Awakening has a liberal sprinkling of Indiana Jones dust throughout, and I loved that. There is a very strong cinematic quality to this book that made it easy for me to envision all the action as it unfolded on the page. However, this characteristic could not carry the book for me. I often found the writing style to be awkward, and although Declan Stewart often takes a break to stare into the distance and ponder the meaning of his life, the characters seldom rose above the one-dimensional for me. I wanted to learn more about Q, but that is evidently being saved for the next two installments of the trilogy. Since I had so many problems with the way the story was told in this first book, I feel that I am doomed to ignorance... unless the books do make it to Hollywood. Margot-- it couldn't be a bad book because I did read it till the end, but I do think it would be better as a film than as a book. Hmm - I have this one but haven't started it yet. I think you've convinced me to leave it unread. There are too many on my TBR list that I know are great to bother with one that sounds average. I know exactly what you mean, SuziQ!